If you get the AAPA Journal, you may have noticed my ad. I had three people communicate with me about the image. The tile is a 9x12x1 inch tile that is pictured in it's bisque state. The image is of James Lee Soffer and the only reason I am showing you this is simply I had the photos in my "update" folder and thought, "Why not?" Here is the photo I worked with that is the source for the portrait. Jim is, to say the least, a character. (Look at the twinkle in his eyes!) I once told him to send me 300 dollars and that I would send him something nice. 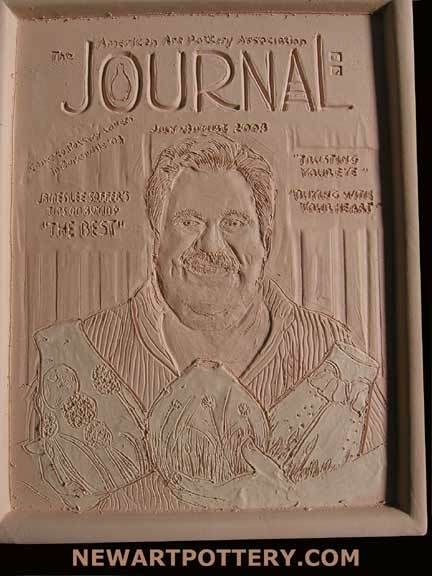 After he received the piece I sent, he left me the most unusual answering machine message I ever heard. 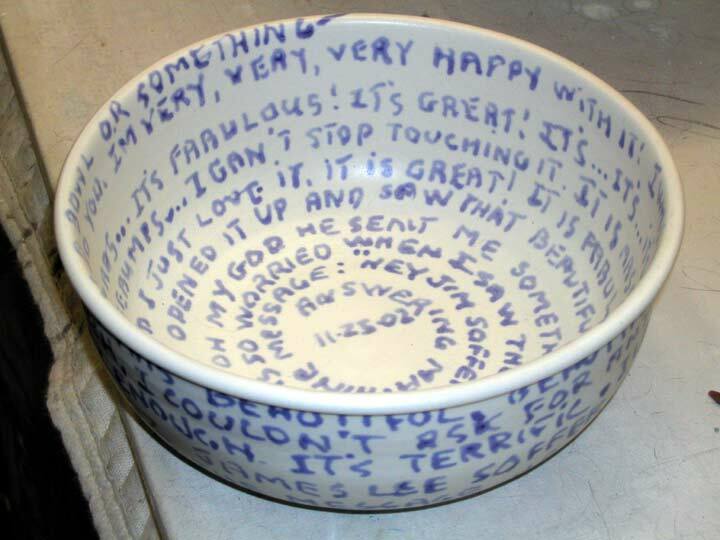 So unusual, that I felt compelled to put the text of the message on a bowl. It was one of the most effusive and excited diatribes I ever heard. Like I said, I am showing it to you because I had the images on hand and I have to fill this page. 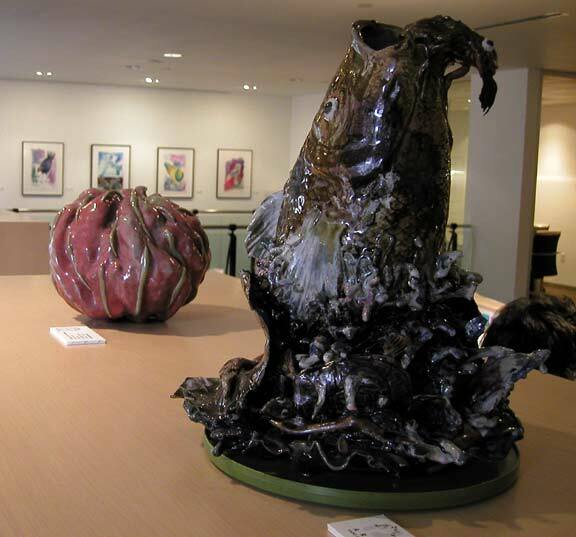 I also would like to show you four sculptural pieces I have in a St. Louis gallery. 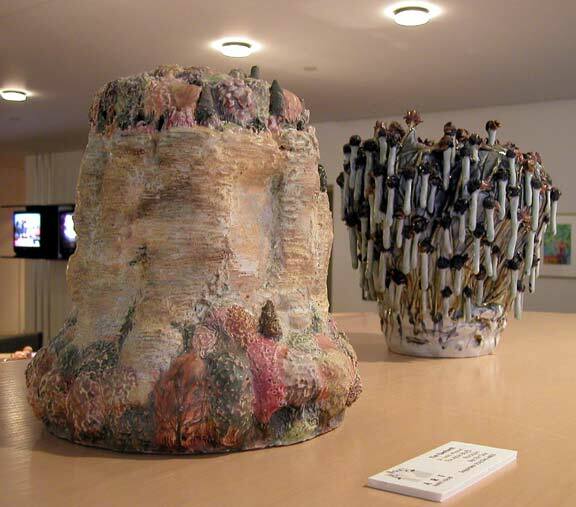 You may have seen them before- depending on how closely you scrutinize the occasional studio photo I put on my updates. These two are titled "The Alton Bluffs" and "Frozen Seedheads." And the fish piece is titled "One Damn Thing After Another" and the red piece is "Coming or Going." I made a number of Asian shaped double gourds that I intend to intensly decorate. Also, they are smaller and many folks prefer smaller pieces. 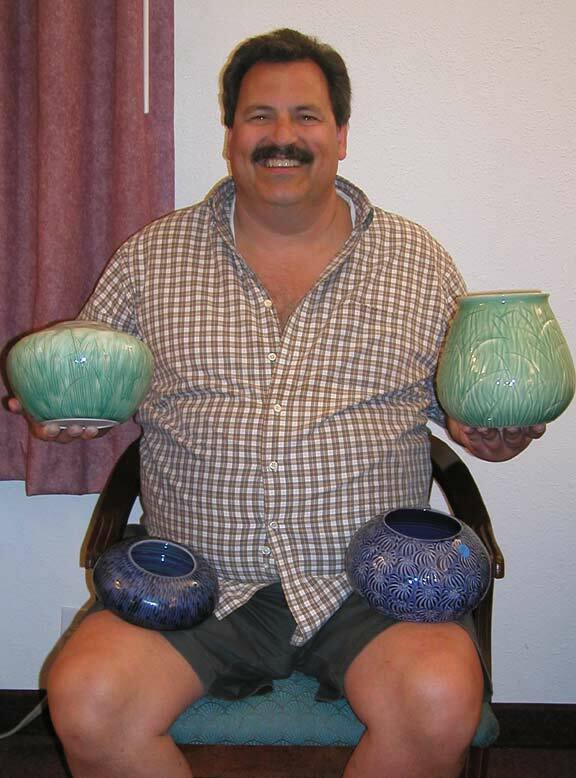 To date, I have been making bigger pots. 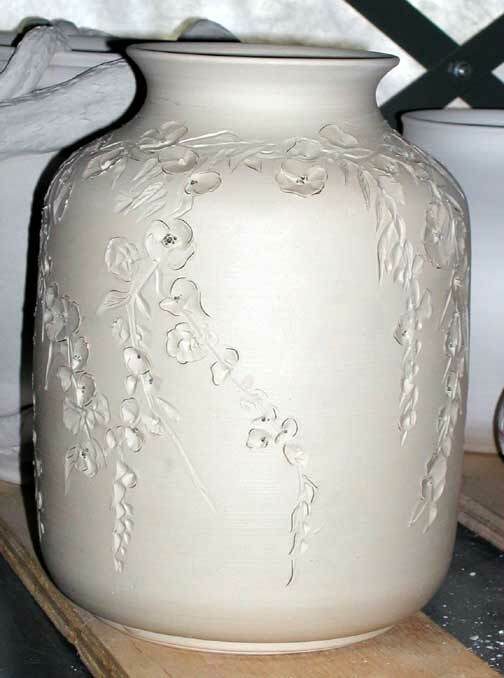 Like this- a big heavy 14" tall piece. I have a feeling that the Poplar pots are going to be in high demand this year and I made a few more. I should have perhaps 6 of them this year. 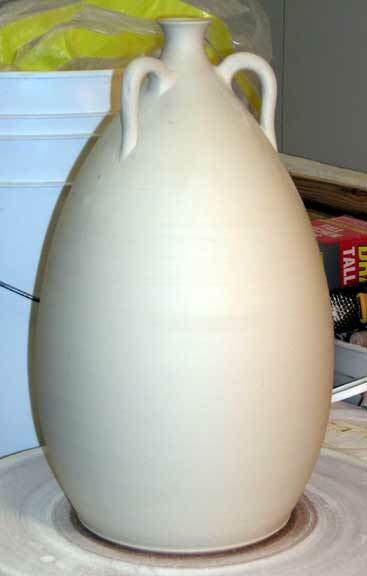 Wait until you see the how I glaze this pot. I HAVE A VISION! Here is a small piece of sculpture I have been spending WAY TOO MUCH time on. And one more picture that does not really pertain to what I have been up to, but I happened to have this photo in my update file as well. 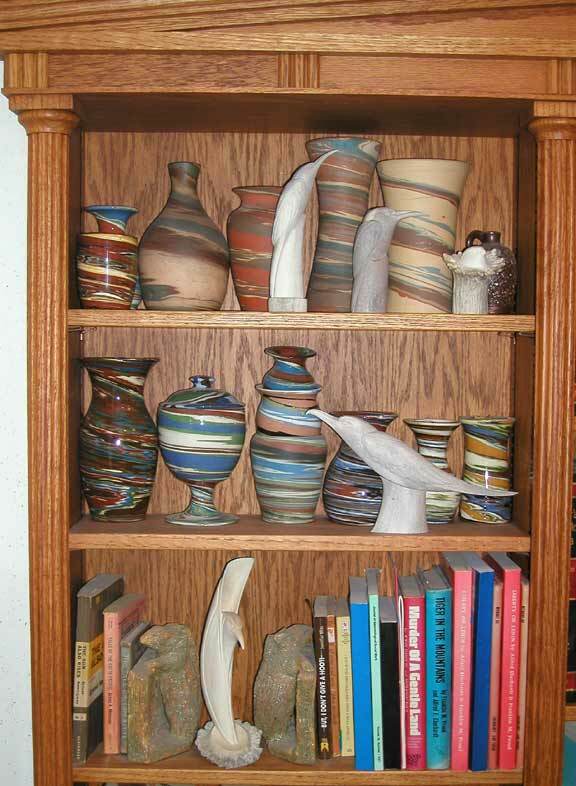 These pots are all Evan's Pottery/Desert Sands, including the mole bookends. 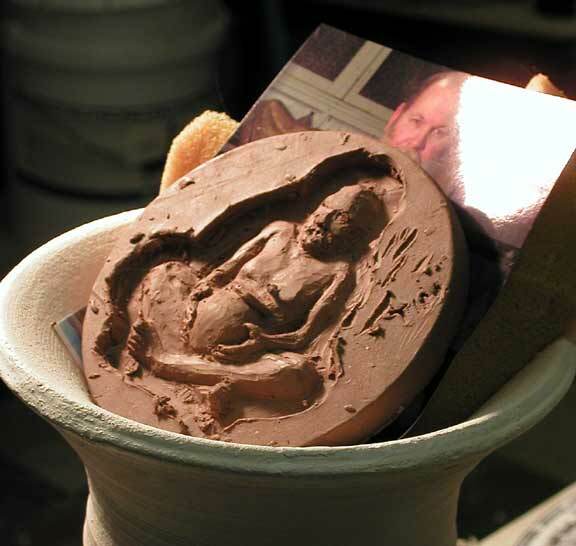 I have a number of other Evan's pieces and have met a couple of the family potters. And in case you are wondering about the carvings, they are antler carvings by a woman named Maureen Morris up in the Yukon Territory. Well heck, as long as I am pointing out "stuff," notice the bookcase. It is my "Greek Temple" bookcase that I made about 15 years ago. If you saw the whole thing, you would see it has all the architectural elements of a typical Greek temple- triglyphs, menopies, pediments, you name it. Rather than just show you a piece of the bookcase, I just ran and took a picture of the whole thing. I am very proud of this bit of woodworking and am happy to show it off. Eighty percent of what will be available this year will be new. I am making some wonderful things, many of which I will not show until they are for sale. Save your money- start a special pot fund. If you like my pots, you will lust after some of the new pieces.